This volume collects P. M. S. Hacker's papers on Wittgenstein and related themes written over the last decade. Hacker provides comparative studies of a range of topics--including Wittgenstein's philosophy of psychology, conception of grammar, and treatment of intentionality--and ... read full description below. 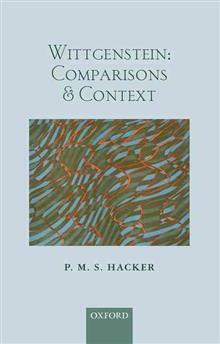 By Hacker, P. M. S.
Wittgenstein: Comparisons and Context is a collection of P. M. S. Hacker's papers on Wittgenstein and Wittgensteinian themes written over the last decade. It presents Hacker's own (Wittgensteinian) conception of philosophy, and defends it against criticisms. Two essays compare Wittgenstein with Kant on transcendental arguments, and offer a Wittgensteinian critique of Kant's transcendental deduction. Two further essays trace the development of Wittgenstein's philosophy of psychology, and examine his anthropological and ethnological approach to philosophical problems. This leads naturally to a synoptic comparison of Wittgenstein's later philosophy of language with formal, truth-conditional conceptions of language. A further two clarificatory essays follow these comparative ones: the first concerns Wittgenstein's conception of grammar, and his exclusion of theses, doctrines, dogmas, and opinions in philosophy; the second concerns his treatment of intentionality. The penultimate essay examines Quine's epistemological naturalism, which is often presented as a more scientific approach to philosophical problems than Wittgenstein's. The final essay offers a synoptic view of analytic philosophy and its history, in which Wittgenstein played so notable a part. The volume complements Hacker's previous collection, Wittgenstein: Connections and Controversies (OUP, 2001), but stands as an independent contribution to work in the field. P. M. S. Hacker is Emeritus Research Fellow at St John's College, Oxford. He is author of Insight and Illusion (Clarendon Press, 1972 [2nd revised ed. 1986]), the four-volume Analytical Commentary on the Philosophical Investigations, the first two volumes, co-authored with G. P. Baker, of Wittgenstein's Place in Twentieth-Century Analytic Philosophy (Blackwell, 1980-96), and Wittgenstein: Connections and Controversies (OUP, 2001). He has written extensively on philosophy and the neurosciences, most recently Philosophical Foundations of Neuroscience (Blackwell, 2003), and History of Cognitive Neuroscience (Wiley-Blackwell, 2008), co-authored with M. R. Bennett. He is currently writing a three-volume work on human nature, the first volume of which, Human Nature: the Categorial Framework, was published in 2007 (Blackwell). The sequel, Human Nature: the Cognitive and Cogitative Powers, is to be published in 2013.